Back to Nature Foods Mother Nature’s Day Sweepstakes – Win a Back to Nature prize pack! 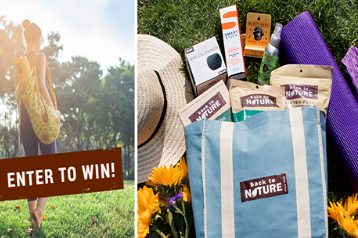 Win a Back to Nature prize pack worth $150 (5 winners)! ENTER SWEEPSTAKES HERE – Back to Nature Sweepstakes page. ENTRY LIMIT – Limit of one entry per person, per day, throughout the entire Sweepstakes Period. ELIGIBILITY – To enter the Sweepstakes, you must be a legal resident of any of the 50 states or the District of Columbia and be 18 years of age or older as of the date of entry. SWEEPSTAKES ENTRY PERIOD – The Back to Nature “Mother Nature’s Day Sweepstakes” begins on Facebook at 12:01 a.m. Eastern Time (“ET”) on April 25, 2016 and ends at 11:59 a.m. ET on May 8, 2 016. PRIZES – Five (5) Winners will receive one Nature Prize Pack which includes the following items: One (1) Back to Nature logo BPA-Free Water Bottle, one (1) reusable Back to Nature bag, select Back to Nature product, one (1) original Burt’s Bees lip balm, one (1) Smart Stuff Natural Mineral Sunscreen, one (1) Smart Stuff Natural Insect Repellent, one (1) Sun Hat, one (1) Water-Resistant Picnic Blanket Tote, one (1) Portable Stereo Wireless Speaker, one (1) 15×24” yoga gym towel, one (1) headband, one (1) yoga mat. The Back to Nature Nature Mother Nature’s Day Prize Pack approximate retail value (“ARV”) of the prize is $150.00.